I finally received my first issue of my American Scientist magazine subscription yesterday, and consumed a chunk of it in my spare time last night. 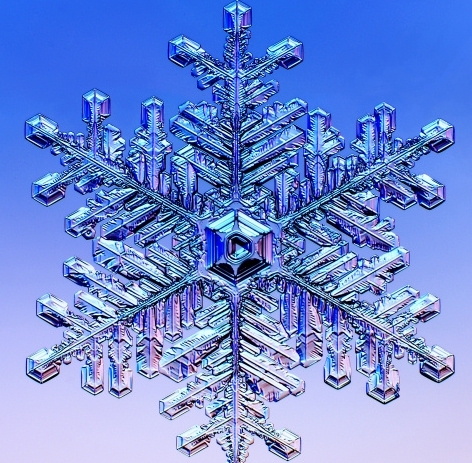 The cover has this awesome snowflake image, from a microphotography snap of a complex snowflake. Here’s a cropped shot of it, taken from the web site by the author of the snowflakes article in the magazine(apologies for that horrid grammar). I hope I won’t get in trouble from the author from snagging this photo. In the article, Kenneth G Libbrecht discusses the creation of snowflakes, the different kinds of snowflakes, some history of snowflake studies and snowflake photography, “designer” snowflakes, and much more. Reading this is akin to reading a Scientific American article, although I find American Scientist articles to be much more readable. The article is available online, but you have to subscribe to the magazine or be a member of Sigma Xi to access it. I recommend just buying the magazine at the newstand. It is in fact true that no two snowflakes are alike. These single crystals of ice are so affected by subtle changes in temperature, water saturation, mineral content and wind speed that it’s nigh impossible that two would experience the exact same conditions during their growth. Indeed, just a few degrees’ temperature shift can alter a snowflake from the flowery form that we typically think of into a needle or a cluster of bullet-shaped columns. Libbrecht details many of these forms and how they arise, but also how much remains unknown about the elusive shapes. One of his newest theories relates to the fact that the very thin edge of a snowflake becomes highly unstable, leading to unexpected growth. Libbrecht’s work can be applied to the growth of crystals used for semiconductors, as well as other nanoscale processes of material formation. All that said, I really just want to direct folks to the author’s web site. There are some amazing images there, and a lot of information on snowflakes. It’s a much more interesting topic that I would have guessed.